The music on H. luminous had a similarly intuitive, exploratory origin. Ayurveda’s four instrumentalists actually set out to write that most elusive of things for a progressive rock band, a four-minute single. But the music took them elsewhere, and soon the whole band realized that something much more ambitious was taking shape. 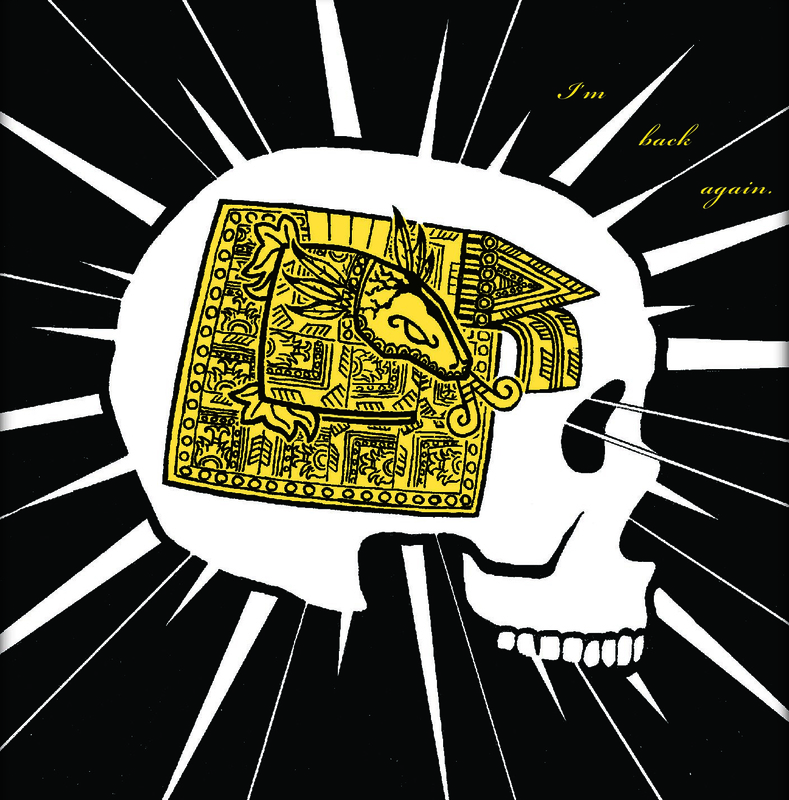 Mystical, atmospheric sounds in some parts of the album call to mind Radiohead; other more ponderous and titanic sections evoke the power of Led Zeppelin and the primal virtuosity of Tool. H. luminous was recorded live in the studio, with the four instrumentalists playing together and only the vocals overdubbed later. Burchinal’s parts were added in a similar style later, with all lead and harmony vocals recorded in a single four-hour session. The aim was to capture the intuitive, collaborative vibe in which the album was written. Listen to the whole album! So my good friend Jessica Weston was overly awesome enough to stay in town for the weekend (breaking her other plans) just to take pictures at my art show DANCE ON YOUR GRAVE. Sadly her flash decided to die so we just got a couple good pictures from the show but no worries… there will be so much more rad art shows/dance parties from MC DEATH BEAR in the future LOL. There was a really good turn out for the night and I think the show was an ultra success. I’d like to thank Jessica Weston for taking photos for the show, DJ CUTMAN for rocking some mad dope chiptunes at the opening, HomeGrown Board Shop for letting me book an art show at their store, Pixel Lounge for letting me book my after party there, Mario B for coming up and completely KILLING ITHACA NY, All my SickDamage.com brothers who came from Buffalo for the show, My housemate and Moving Box Studios co-worker Nicoli for running a video camera for the show (video coming soon!) and YOU all the MC DEATH BEAR CUBS who support me… Thanks! 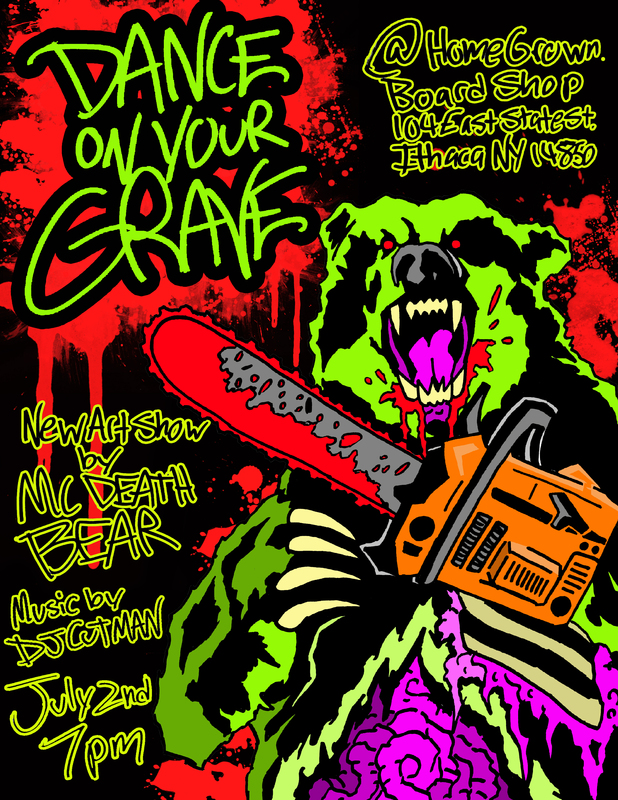 MC DEATH BEAR (Moving Box Animator and graphic artist) is having his 4th solo art show DANCE ON YOUR GRAVE will be July 2nd, 7-9pm @HomeGrown Board Shop Ithaca, NY. He’ll be making all new stencils and pixel/lego for the show! Also fellow Moving Box Studios flash animator and sound engineer Chris Davidson aka DJ CUTMAN will be playing video game music/chip-tunes at the opening! Be there DEATH BEAR CUBS! The DANCE ON YOUR GRAVE after party will be at Pixel Lounge starting at 10pm, 21 and up, no cover, and will be DJed by overly dope Buffalo NY based DJ… MARIO B! So after checking out the dope art work DANCE ON SOME GRAVES!